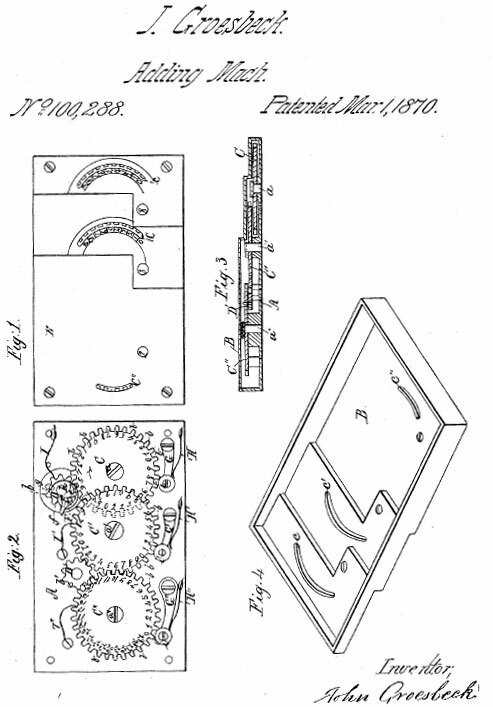 On March, 1st, 1870, Groesbeck took out a US patent №100288 for Adding Machine (see the lower patent drawing). The adder of Groesbeck was not of original construction. Similar devices were made earlier by David Roth (in 1842) and patents for such devices were granted to John Campbell (US pat. №24990) in 1859, and Thomas Strode (pat. №US30264) in 1860. The machine was advertised in newspapers in early 1870s (see the lower image) and was manufactured by the company Ziegler&McCurdy, Philadelphia, and distributed by S. H. Crittendon & Co. It was sold for $6.00 in 1871. It seems however, that it was never widely sold and production was soon ceased (Ziegler&McCurdy was dissolved in 1872). The original patent had 3 digital positions only, but actually the machine was manufactured with more, usually 5, digital positions. There are also other differences between the patented and the real-life device, e.g. the wheels in the patent are stepped (each wheel is on a different level), while in the real device all wheels are on the same level (large wheels are tilted to the left, so that successive gears are no top of the ones to the right). Also, the substraction option is not shown in the patent. 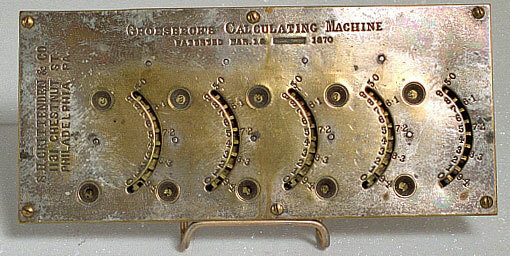 It was a row adding device, made by brass (the mechanism), nickel-plated brass (the outer casing), and steel (the pivots of the gears) with measurements: 8 cm x 16.8 cm x 7.5 cm. It has (usually) 5 dials and corresponding result digits, numbers can be added into any one of the dials. The device hadn't clearing mechanism (i. e. it must be cleared manually), and can be used not only for addition, but for subtraction also (the bottom row of five small windows shows the results for addition, while the top row of windows is used for subtraction). During the subtraction however, the initial number must be entered as a complement to 10. The stylus-operated flat adding machine (usually) has five cogged, linked wheels. Each wheel has three repetitions of the integers 0 through 9; correspondingly, there are 30 teeth, for an angle of 12◦ between them. Between big wheels are smaller wheels, in order to perform the carry operation. The design also included detents and other advanced improvements. The wheels are set by means of a pointer, which is placed in the concentric slots c, c' and c'' of the cap-plate in the figure 1 from the patent drawing. The result can be seen in the windows d. Actually there are two rows of result windows, one for adding and another for subtracting—five windows at the bottom show sums of numbers entered, while five windows at the top show complementary digits and are used in subtraction.